In this sixtieth anniversary edition of The Idea of Nationalism, Craig Calhoun probes the work of Hans Kohn and the world that first brought prominence to this unparalleled defense of the national ideal in the modern West. At its publication, Saturday Review called it "an enduring and definitive treatise.... [Kohn] has written a book which is less a history of nationalism than it is a history of Western civilization from the standpoint of the national idea." This edition includes an extensive new introduction by Craig Calhoun, which in itself is a substantial contribution to the history of ideas. 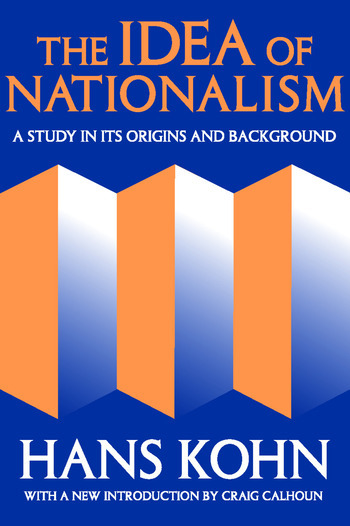 The Idea of Nationalism comprehensively analyzes the rise of nationalism, the idea's content, and its worldwide implications from the days of Hebrew and Greek antiquity to the eve of the French Revolution. As Calhoun explains, Kohn was particularly qualified to undertake this study. He grew up in Prague, the vigorous heart of Czech nationalism, participated in the Zionist student movement, studied the question of nationality in multinational cultures, spent the World War One years in Asian Russia, and later traveled extensively in the Near East studying the nationalist movements of western and southern Asia. The work itself is the product of Kohn's later years at Harvard University. In The Idea of Nationalism, Kohn presents the single most influential articulation of the distinction between civic and ethnic nationalism. This has shaped nearly all ensuing research and public discussion and deeply informed parallel oppositions of early and late, Western and Eastern varieties of nationalism. Kohn also argues that the age of nationalism represents the first period of universal history. Civilizations and continents are brought into ever closer contact; popular participation in politics is enormously increased; and the secular state is ever more significant. The Idea of Nationalism is important both in itself and because it so deeply shaped all the work that followed it. After sixty years his interpretations and analyses remain acute and instructive.